Sit in any comfortable postion. 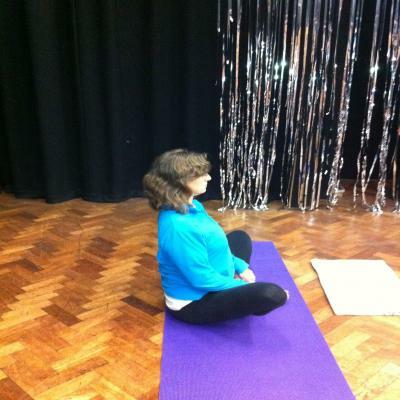 Many yogis use the sitting position I have shown in the photograph but if your shoulders are slightly raised like mine you would be better sitting on a chair or against a wall! The important thing is to have your back as upright as possible and your chest open. If you sit against a wall, you can try to get your shoulders against the wall and that will help you get the feel of an open chest. Shut your eyes and just concentrate on your breathing. Can you feel the air coming in to your nose? Can you feel it leaving your nose? Can you count and see how long it takes for you to breath in? Can you count and see how long it takes to breath out? Now we need to find out whether your breathing was all in the top of your chest or whether you were using your diaphragm to bring in air to every part of your lungs? Place your hands on your midriff with the palms facing your body. Gently move the hands until your longest finger on one hand is just touching your longest finger on the other hand. Breath in. Observe what happens to your fingers. If you are using your diaphragm the fingers will gently move apart on the in breath and return to touch each other on the out breath. Most of us forget to breath deeply enough. So practise taking the deep breath several times a day and see if you can take a few counts longer to breath in and to breath out than you used to do. Counting four for breathing in and four for breathing out is fine, but make it a "one elephant" count which if you say it out loud takes about a second rather than a quick one, two, three , four which could also be said in a second! If at any time you feel you have lost the rhythm to your breathing, just relax and let your body take over. Don't force your breathing. I often find that I put so much effort into trying to lengthen my breath that my breathing starts to feel unpleasant. Whenever that happens, I simply stop trying and let my body breath as it wants to. Once everything feels normal again, I have another go at getting a steady, longer, deeper rhythm to my breathing. When you do find the right pace for you, it will feel relaxing and peaceful but also life-enhancing.